For many, the thought of a random act of violence on Sunday night was unbelievable. After 2-1/2 days of commemorative, non-violent, rejuvenating activities planned for the anniversary weekend of Mike Brown’s murder, shooting erupted in Ferguson. Because police lie and deceive routinely, it is difficult to know what the circumstances were around the shoot out that left Tyrone Harris, Jr. (a black teen) critically wounded. The narrative about the weekend quickly pivoted to why police must be ready with their militarized department to quell any kind of unrest by black folks and their allies. 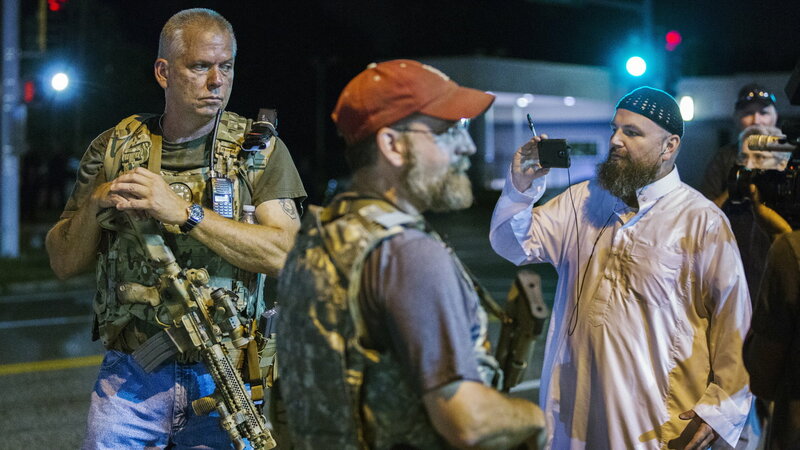 The St. Louis Post Dispatch was compelled to change its whole cover page to make the adjustment, from a headline of “In This Together” to “A Violent Turn.” To add insult to injury, the Oath Keepers were allowed to come into town and patrol the streets, visibly armed and ready to carry out their oath to keep black people in their places. We must control our narrative and we must control our streets. Let’s get to work.